, an author to whom the curious in literary history are greatly indebted, was probably a native of Paris, and born towards the conclusion of the seventeenth century. He was bred up as a bookseller in that city, a business which always requires some knowledge of books, but which he carried to an extent very unusual, and for forty years employed almost the whole of his time in inspecting the works of eminent authors, inquiring into their history, their editions, differences, and every species | of information which forms the accurate bibliographer. 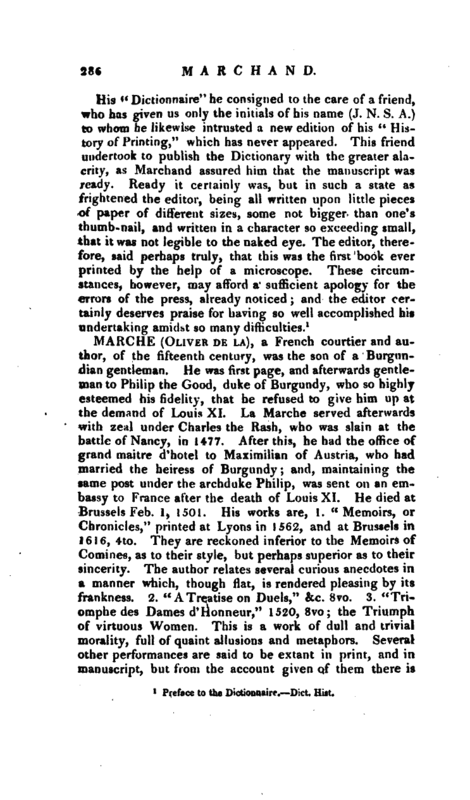 During the time that Mr. Bernard published the “Nouvelles de la Republiques des Lettres,” Marchand was his constant correspondent, and contributed all the literary anecdotes from Paris, which appeared in that journal. 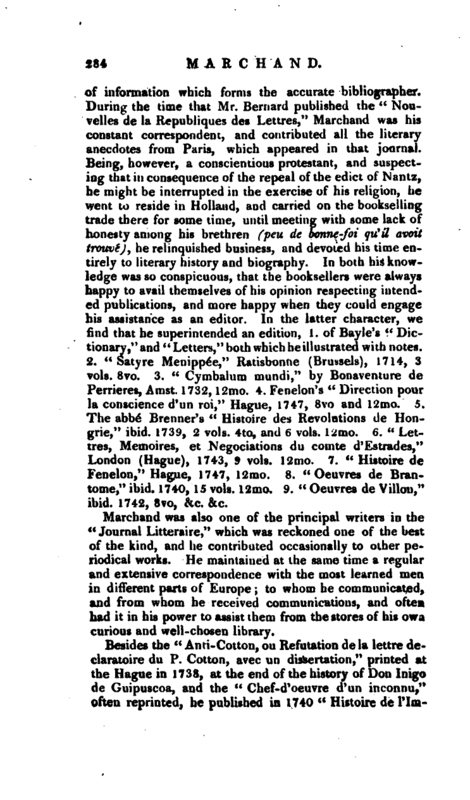 Being, however, a conscientious protestant, and suspecting that in consequence of the repeal of the edict of Nantz, he might be interrupted in the exercise of his religion, he went to reside in Holland, and carried on the bookselling trade there for some time, until meeting with some lack of honesty among his brethren (pen de bonne-foi qiCil avoit trouvej, he relinquished business, and devoted his time entirely to literary history and biography. In both his knowledge was so conspicuous, that the booksellers were always happy to avail themselves of his opinion respecting intended publications, and more happy when they could engage his assistance as an editor. 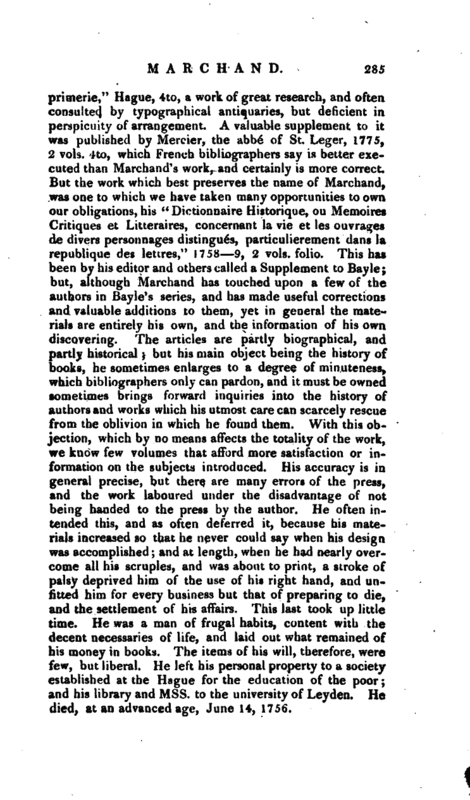 In the latter character, we find that he superintended an edition, 1. of Bayle’s “Dictionary,” and “Letters,” both which he illustrated with notes. 2. “Satyre Menippee,” Ratisbonne (Brussels), 1714, 3 vols. 8vo. 3. “Cymbalum mundi,” by Bonaventure de Perrieres, Amst. 1732, 12mo. 4. Fenelon’s “Direction pomla conscience d’un roi,” Hague, 1747, 8vo and 12mo. 5. The abbe Brenner’s “Histoire des Revolutions de Hongrie,” ibid. 1739, 2 vols. 4to, and 6 vols. 12mo. 6. “Lettres, Memoires, et Negociations du comte d’Estrades,” London (Hague)^ 1743, 9 vols. 12mo. 7. “Histoire de Fenelon,” Hague, 1747, 12mo. 8. “Oeuvres de Brantome,” ibid. 1740, 15 vols. 12mo. 9. “Oeuvres de Villon,” ibid. 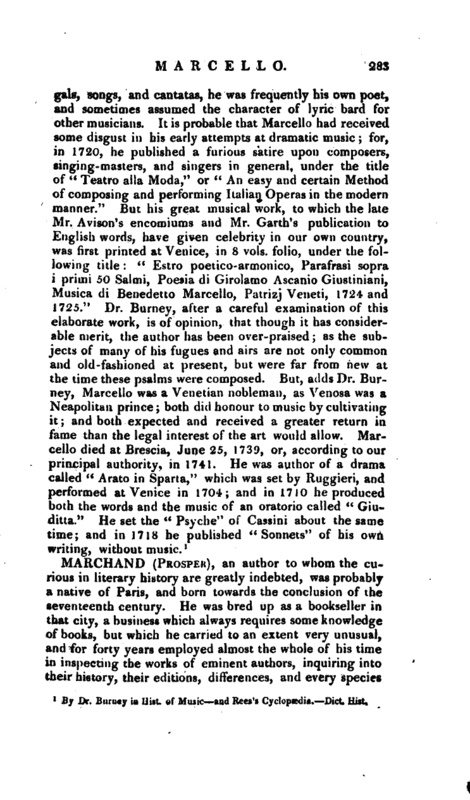 1742, 8vo, &c. &c.
Marchand was also one of the principal writers in the “Journal Litteraire,” which was reckoned one of the best of the kind, and he contributed occasionally to other periodical works. He maintained at the same time a regular and extensive correspondence with the most learned men in different parts of Europe; to whom he communicated, and from whom he received communications, and often had it in his power to assist them from the stores of his ow, curious and well-chosen library. 1 Preface to the Dictionnairr. —Dict. Hist.